I’m going to explain how I went about replacing the clutch on my 2004 ZHP Sedan in five parts. Part I is the introduction and explains how I prepared for the replacement. Part II explains how I removed the transmission. Part III details the clutch parts I replaced. Part IV details transmission installation. Part V details lessons learned, clutch review, a shifter replacement DIY, and ancillary information. 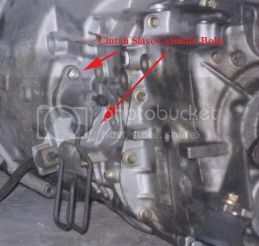 While there are a few E46 DIY clutch sites, I didn’t find any that were complete; they all left out critical information. I researched the Bentley manual, the BMW ETK, and online resources prior to starting. Our ZHPs with 6-speed are unique to E46s; they use a different flywheel, pilot bearing, clutch and driveshaft. These instructions are not detailed: they assume that 1) you have some mechanical background, 2) you can figure some stuff out for yourself or can look it up in the service manual or internet, and 3) you have a healthy respect for safety. Please follow these instructions at your own risk; failure to take appropriate and reasonable safety precautions can lead to injury or death. I needed to replace the clutch on my ZHP because it was slipping under load (particularly at hard launches), even though it had less than 90k miles on it. Although my ZHP puts out between 325-350 HP because of the installation of an ESS TS2 supercharger, I treat it pretty civilly. It never had a clutch delay valve and I don’t ride the clutch, so I’m not certain of the cause of its premature wear. Perhaps the self adjusting clutch (SAC) feature has something to do with it. My most important decision was what clutch, pressure plate and flywheel to purchase. There are not as many clutch assemblies available for our ZHPs as there are for 5-speeds. I considered three different types: 1) stock SAC clutch, pressure plate, and flywheel, 2) Sachs heavy duty (HD) clutch and pressure plate with stock flywheel, and 3) UUC high performance clutch, pressure plate, and lightweight flywheel. I quickly eliminated the Sachs clutch option. 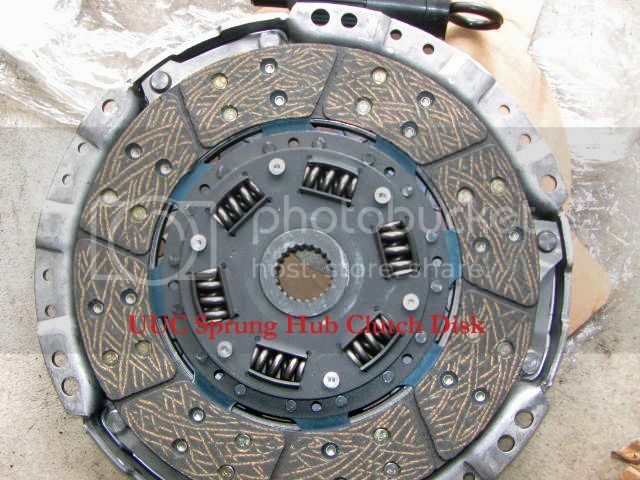 While it is probably the best clutch assembly of the three, it also cost $300 more than stock. 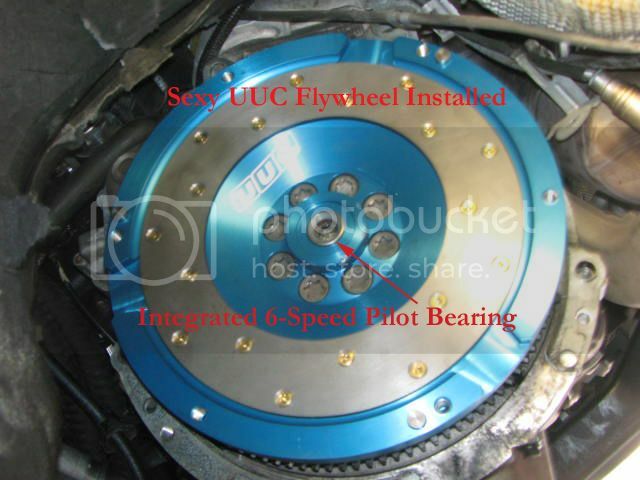 I initially discounted the UUC product because of its lightweight flywheel. Although every Ricky Racer wants to install a lightweight flywheel into their ride, they often don’t know the draw backs. First is the infamous lightweight flywheel rattle; even though it is benign, it sounds like you have some loose bolts rattling around inside your transmission when in neutral. Then, you sometimes have to adjust how you drive; additional throttle is required when you start from first gear because you no longer have flywheel inertia to propel the car. And for what? To save a few pounds and get slightly better throttle response? Meh. 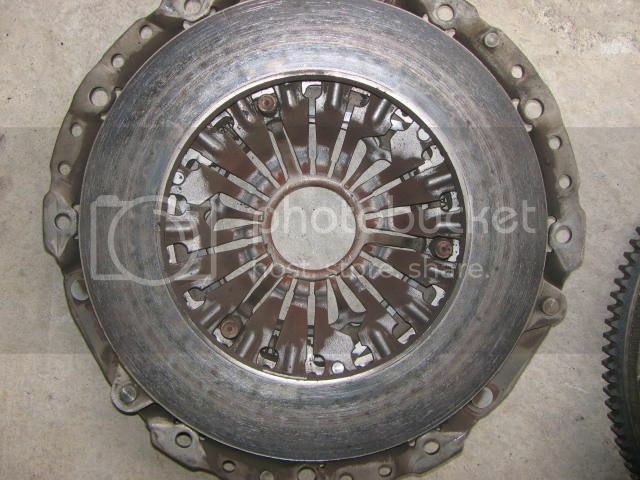 I initially selected the stock clutch, pressure plate and flywheel because I believed it would be the lowest price, easiest to install, and provide adequate clamping force. However, research showed me that 1) the UUC product was cheaper when including shipping (OE dual mass flywheels are expensive and heavy), 2) installation was more involved because of the SAC mechanism, and 3) I may end up with the same problem if my slipping was caused by the SAC mechanism. During my selection process, UUC advertised a particularly good sale: 15% off and free shipping (flywheels are heavy and expensive to ship). I went for it, but soon found that there was some unexpected expenses with UUC. Their sales person indicated that the UUC kit would include flywheel bolts and a clutch alignment tool for additional savings. However, that is incorrect. After receiving the kit and calling them, I found that they provide those items with the 5-speed kit, but not the 6-speed. They also advise to re-use the original flywheel bolts and align the clutch using the OE shift lever. That is wrong too. Flywheel bolts are single use only and the OE shift lever does not have a snug fit into the flywheel bearing. Next, I had to decide which clutch parts to reuse and which to replace. I ended up replacing all parts that could wear with OE parts. I didn’t get all new transmission mounting bolts, but I got one of each size just in case one broke. Then, I decided which ancillary parts to replace and what to keep. I decided to replace all of the shifter wear parts and get an OE performance short shifter. I had a UUC short shift kit in my old E36 M3 and didn’t really like it. I also decided to replace the Guibo and transmission mount. I decided not to replace the rear main bearing seal and the transmission input and output seals. Those seals should last 200k miles or so, but can start leaking once you start messing with them. Of course, I replaced all hardware specified in the service manual (Guibo nuts, reinforcement plate bolts, exhaust nuts and gaskets, etc). 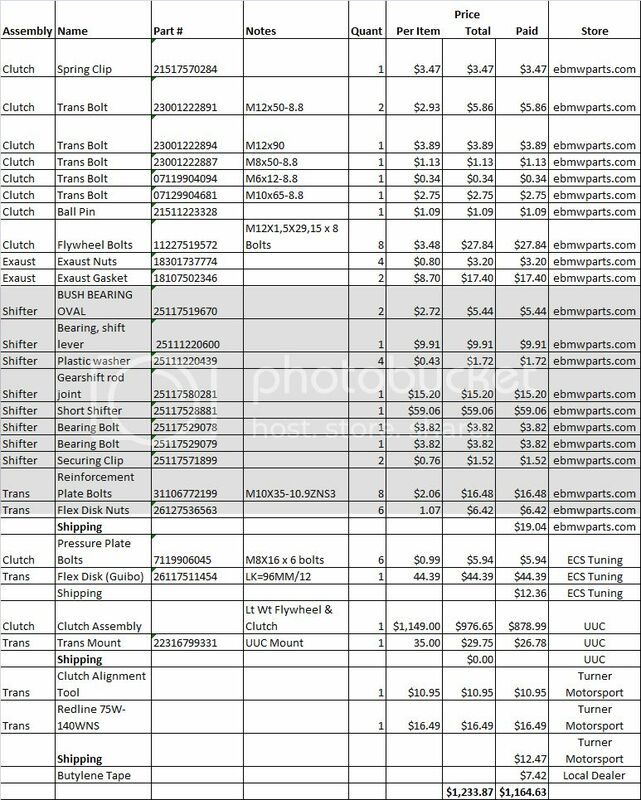 So, I got parts numbers from RealOEM, checked around for the best prices, captured all the information in the attached spreadsheet, and ordered the parts. The whole project will cost me about $1,200. Now it’s time to get to work. Last edited by lkstaack; 03-12-2013 at 12:46 PM. 4. T25, T35, T50, and T60 Torx sockets. T60 isn’t standard with most kits. 1. 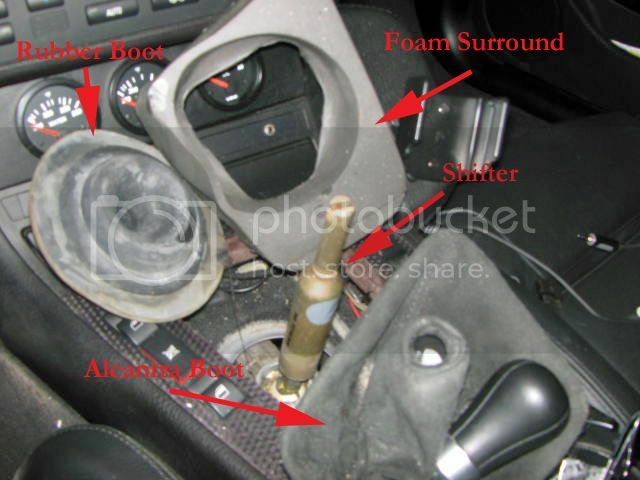 Remove Shifter Boot. (This step is unnecessary if you are not replacing your shifter. However, even if you keep your shifter, it is helpful to have additional light from the cockpit into the transmission tunnel, and the procedure is fast and easy.) Pull up hard on the shift knob with your hands to remove; avoid hitting yourself in the face. Squeeze the edges of the alcantra boot to disengage from surround and remove. Gently pull foam surround up and out. Pull rubber boot edge base away from metal tunnel and lift up. Start at one point and work your way around. Lift up and away from shifter. 2. Lift up the car. I lifted the car up high so that I could use my creeper. Due to its low stance, a floor jack won’t fit under it. So, lifting the car requires a process of using a small jack on a front jack point to bring the front of the car up high enough so that I can use my large floor jack. It is time consuming, so I use ramps whenever possible. Lift the car high enough that you can get yourself under the whole car (higher if you use a creeper) and slide the transmission out from under it, but not so high that you have difficulty accessing the top bell housing bolts. 3. Remove the front wheels. This will allow more light, easier ingress, and better positioning during the process. 4. 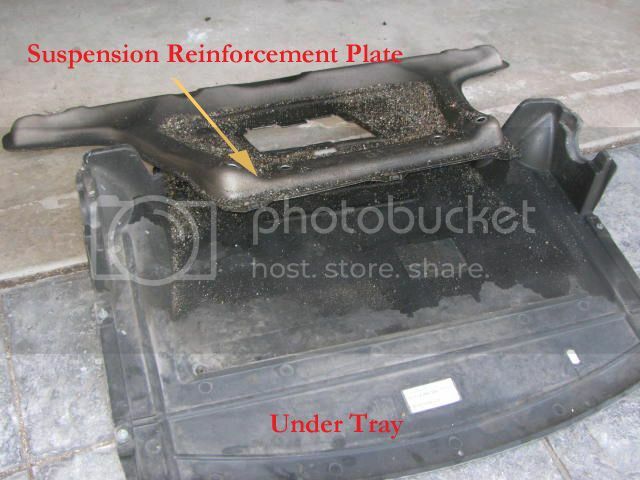 Remove the under tray and front suspension reinforcement plate. The under tray is held on with screws and plastic rivets; the reinforcement plate with 16mm bolts. Do not reuse reinforcement plate bolts. You better wear eye protection, because a lot of debris will likely fall onto your face. 5. Remove the exhaust and heat shield. Spray exhaust manifold nuts and any other nuts on/near the exhaust with a penetrating fluid like “PB Blaster” to free up stuck nuts. Remove exhaust. 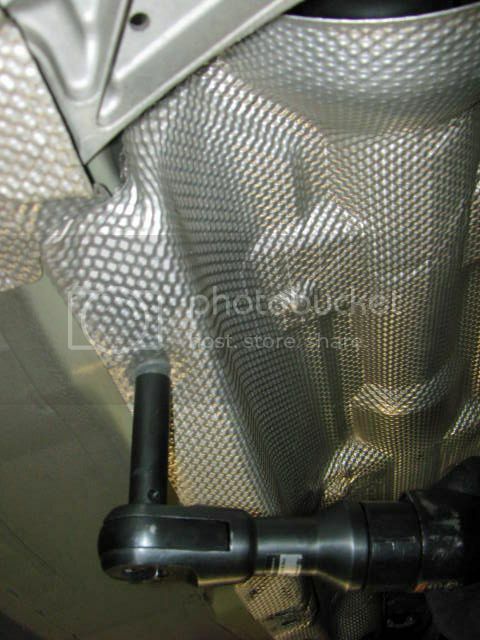 Then, remove heat shield. This would be a good time to drain your transmission fluid if you haven’t recently. 6. 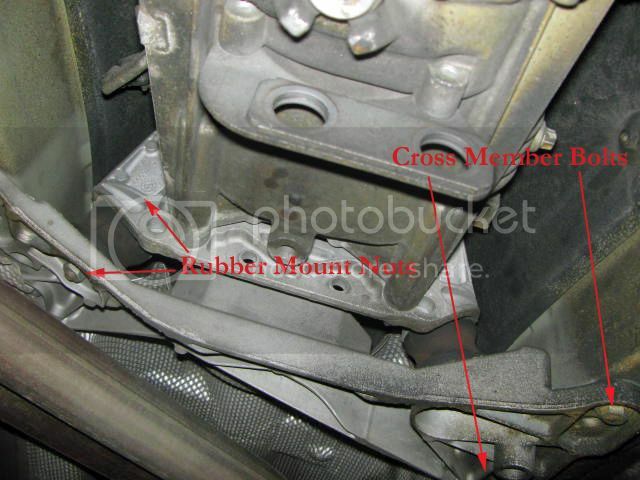 Remove the transmission mount cross member. Mark the location of the cross member relative to the chassis; you want to ensure the cross member (and driveline) are reinstalled exactly as original (use a pencil to outline the cross member). Support the transmission with a jack. Remove the two (2) lower 13mm nuts of the rubber mounts and the four (4) 13mm nuts holding the cross member. Remove the rubber transmission mounts (13mm) at the cross member. You can remove the cross member without supporting the transmission, but there isn’t any reason to stress the drive shaft center bearing. 7. 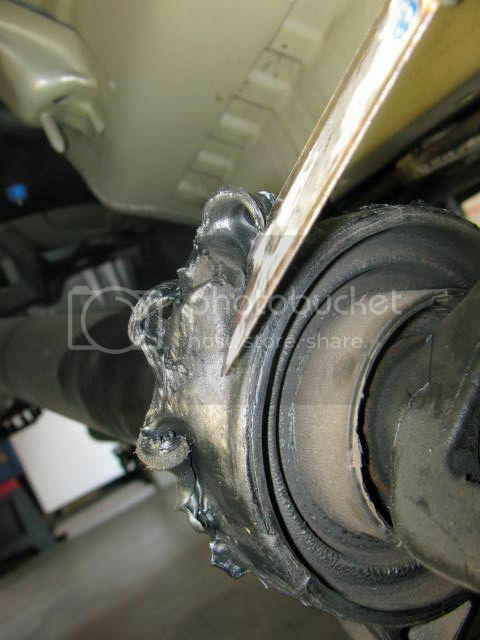 Remove driveshaft. Remove the nuts securing the driveshaft to the flex joint (guibo). Nuts are 19mm and torqued to 74lbs. Remove the driveshaft center bearing cap. Leave the driveshaft bolted to the differential (final drive) and secure it out of the way (I used a coat hanger). ZHPs use a constant velocity (CV) joint between the driveshaft and differential, not a universal joint. Do not allow weight on the driveshaft because it can pinch and tear the CV joint. Clean the sticky black Butylene from the center bearing cap and chassis (I scraped it off with a putty knife and then cleaned it with acetone). 8. Disconnect the shifter. 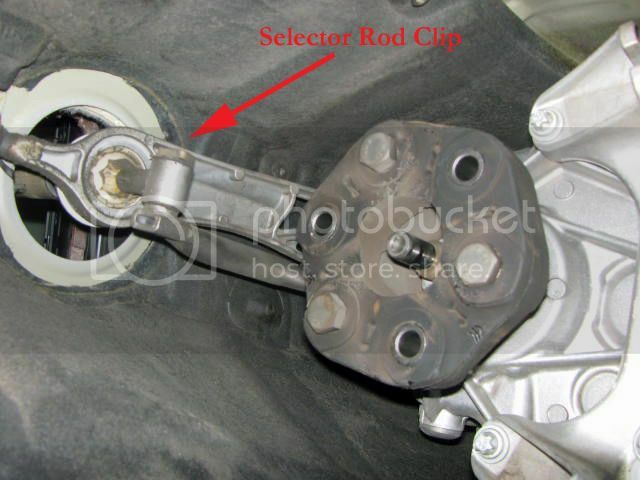 There are two places you have to disconnect it from; the selector rod from the shifter and the carrier from the top of the transmission. 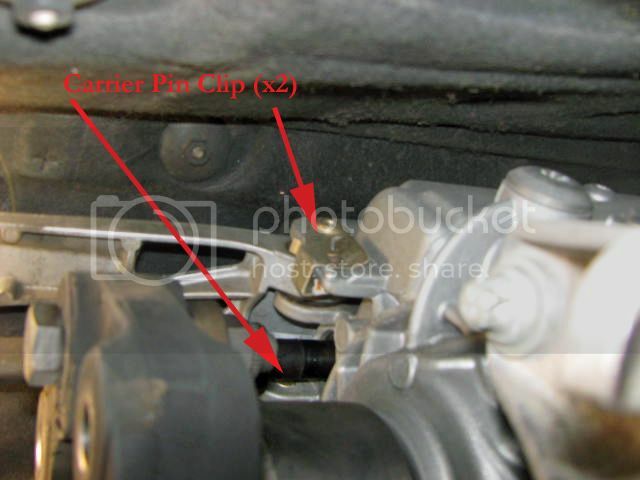 The two (2) carrier pins clip onto the transmission on either side; unclip the pins and pull out. 9. Remove clutch slave cylinder. Unbolt the slave cylinder (13mm) and secure it on top of the left A-arm; don’t remove the hydraulic line. Disconnect the backup lamp plug and detach its harness. 10. Lift front of engine. Place a wood block under the area where the air conditioning pump and idler pulley mount and jack up the front of the engine. Ensure only the engine lifts, not the whole front. This will give you additional room to gain access to the transmission bell housing bolts. 11. Remove transmission bell housing bolts. Undo the nine (9) Torx bolts and one (1) standard bolt that hold the transmission to the engine. See the chart for correct socket sizes. Be sure to note where each bolt goes, because they are different lengths and sizes. The M12 and M10 bolts are on very tight, so you will have to use a breaker bar (although the torque spec is 53lbs, corrosion and time required about 75lbs of effort to break it). 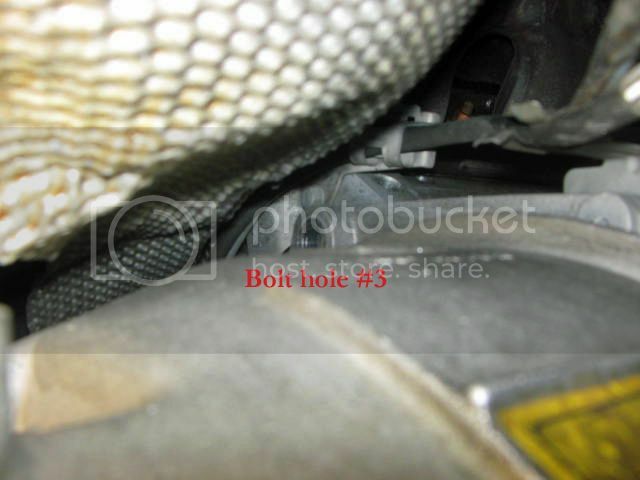 The two bolts at the top of the engine near the cylinder head (#2 and #3) are very difficult to remove. a. In order to remove bolt #2, I used a short wobbly extension and a long 24” extension. The total length should clear the back of the transmission enough to get a breaker bar on it when the socket is around the bolt, but not so long that it is difficult to control. I was unable to see or touch the bolt because of the narrow space between the chassis and bell housing, so I used an inspection mirror to view the bolt and maneuver the socket onto it. I wedged my shop light between the chassis and transmission. Feed the socket and long extension from the back/top of the transmission towards the bolt. b.	Bolt #1 is difficult, but at least you can touch it. Use the same wobbly and long extension you used for bolt #2.
c.	I used the long extension and a universal joint for bolt #3. I had to use a long pry bar to help position the socket onto bolt. Again, feed the socket and long extension from the back/top of the transmission towards the bolt. The farther the bolt unscrews from the bell housing, the tighter the space becomes. d.	Bolt #4 (10mm) is a standard bolt that secures an oxygen sensor cable holder and the metal transmission gasket to the transmission. It faces the front of the transmission, and not the back like the Torx bolts. It is easy to overlook because it is different. e.	The other bolts are easy to remove. 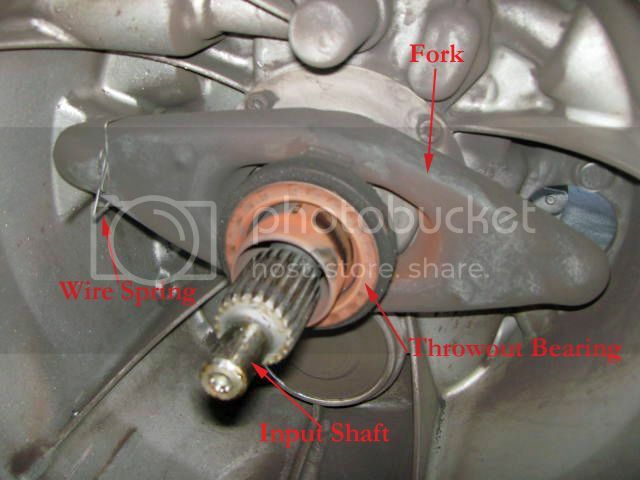 Note that the arrow labeled #11 in the picture is not a bolt, it is a dowel attached to the transmission. The purpose of the dowel is to align the starter motor; this fact is significant when you install the transmission. 12. Pull the transmission away from the engine. Be sure that the transmission is well supported - don't let it hang on the center input shaft as that could cause it to bend. You can use a floor jack, but you have more control with two people under it (one under the bell housing to rotate and pull and the other at the rear to shake and pull). Aggressively shake and rotate the transmission until it comes free and the input shaft clears the engine. My transmission separated from the engine easily (it’s a California car), but I have read of others who had difficulty. The engine/transmission dowels can get corroded from salt/moisture. If so, 1) ensure all bolts are removed, and 2) use a pry bar between engine/transmission, or 3) use a pneumatic hammer. Gently set the transmission on the ground. Celebrate. Last edited by lkstaack; 03-12-2013 at 12:48 PM. We’ll first turn our attention to the engine. 1. Remove pressure plate. Remove the 6 hex bolts (E6). You can reuse these bolts if needed. 2. Remove flywheel. Remove the eight (8) bolts (T60). Use a small pry bar to gently pry off flywheel from supporting dowels if needed. 3. Install new flywheel. Align the flywheel onto the dowel, push it on, and start the bolts. The flywheel is going to turn when you torque the bolts unless you lock it down. You can 1) have a buddy wedge a pry bar against the flywheel teeth, or 2) bolt a strip of metal between the flywheel and bell housing using a bell housing bolt a pressure plate bolt. Technique one is simplest, but requires a second person and a lot of strength. Technique two requires fabricating the metal strip. Use Red Loctite on the bolts and torque flywheel in star pattern. Don’t worry about installing a fresh Pilot Bearing because 6-Speed flywheels come with them integrated into the flywheel. 4. Install clutch disk and pressure plate. 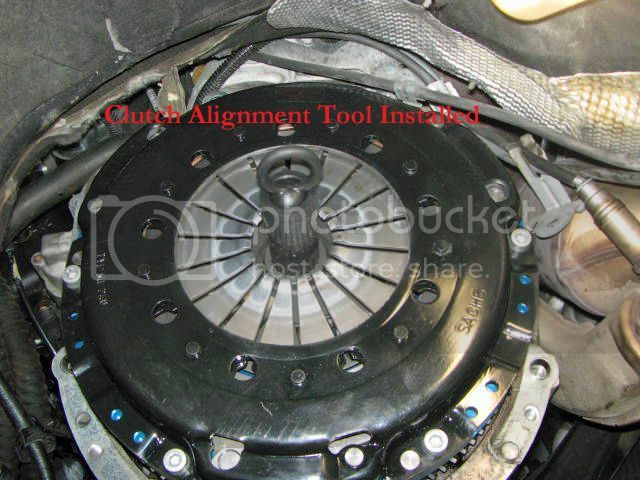 Insert clutch alignment tool through clutch disk and into pilot bearing. Alignment tool fits snuggly into the pilot bearing and will keep the clutch disk centered and steady. 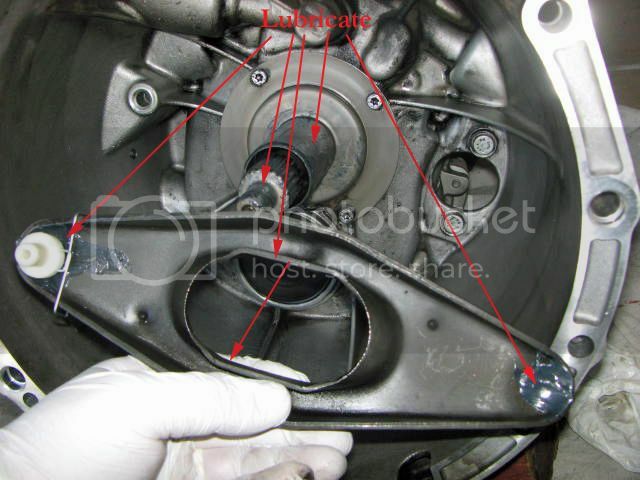 Install pressure plate over clutch disk with alignment tool protruding from the center of the pressure plate. Torque bolts in star pattern. Remove clutch alignment tool. Now let’s work inside the transmission bell housing. 1. Remove the Fork and Throwout Bearing. Pull out the old Throwout Bearing. Pop out the small plastic pivot from the hole behind the bell housing and remove the fork. Remove the wire spring from the pivot and fork. 2. Clean the bell housing. Use some cleaner to clean the inside of the bell housing, the shifter fork, and the input shaft. Ensure there isn’t any dirt, grease, rust or corrosion within the input shaft splines. a.	Gearbox input shaft splines. b. Clutch fork where it contacts the pivot head. c.	Clutch fork where it contacts the slave cylinder piston on the other side. d.	Clutch fork where it contacts the clutch release bearing in the center. f.	Starter motor dowel pin. 4. Reattach Everything. Reassemble the fork and pivot. Push the pivot into the hole in the bell housing. Install the new throw-out bearing. Install a new flex disk (guibo) if you wish and torque to spec (19mm and 74lbs). 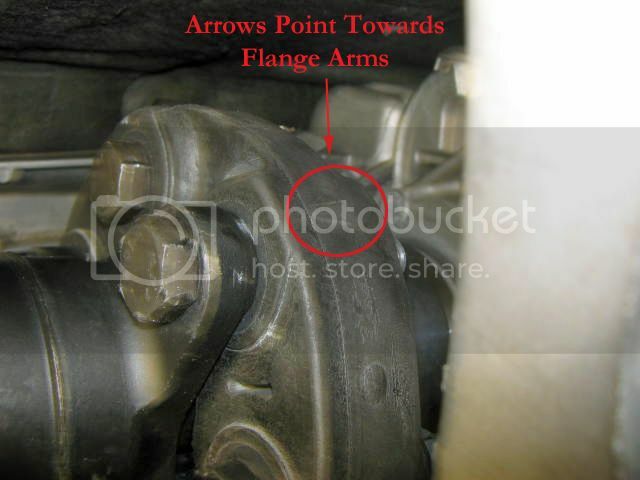 Ensure the “arrows” point towards the flange arms. 5. Fill Transmission with oil. Filling a transmission will never be this easy again. Capacity is 1.7 quarts. Don’t worry about over-filling, you can release excess oil when the transmission is reinstalled. Last edited by lkstaack; 03-12-2013 at 12:50 PM. There are at least three issues that can cause serious heart break when installing the transmission. 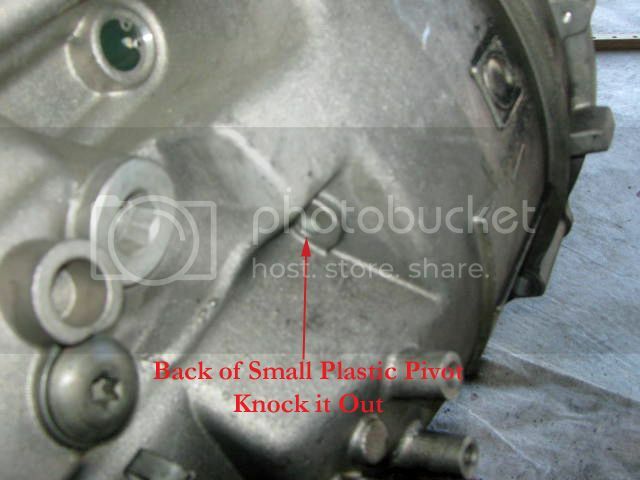 1) You will not be able to get the transmission bolts into the engine unless the metal bell housing gasket is lined up. 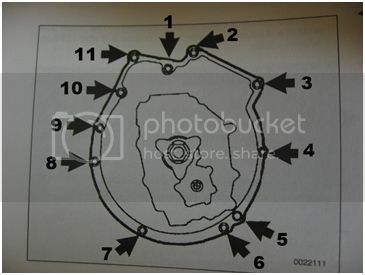 2) The transmission input shaft will not enter the flywheel pilot bearing unless the spline is lined up. 3) The starter motor will not function unless it is aligned properly (understand that the starter motor bolts onto the transmission bell housing, and the bell housing dowel inserts into the starter motor). 1. Prepare Engine. 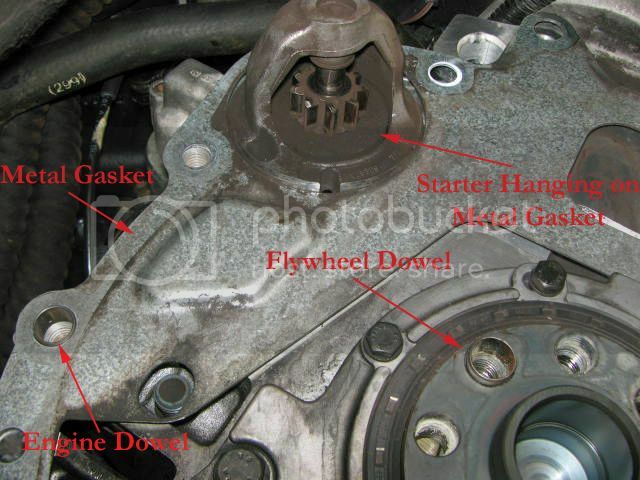 Ensure metal bell housing gasket is inserted into the left and right engine dowels. Ensure starter motor is through the gasket. 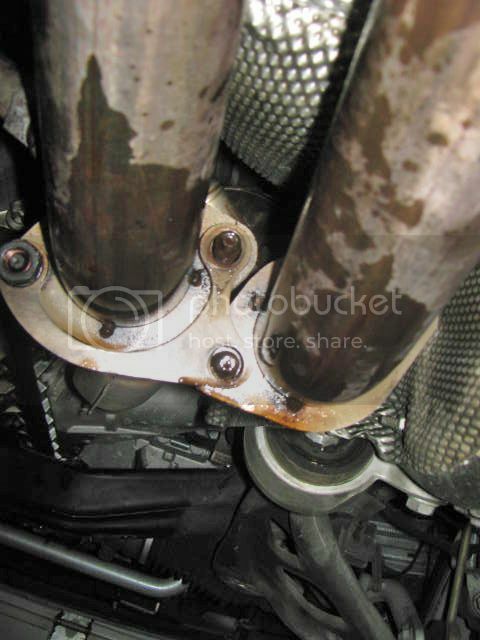 Ensure that gasket is aligned with bolt holes. 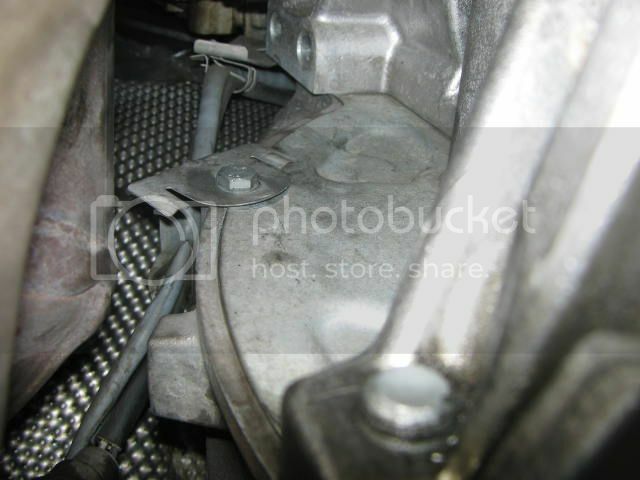 You may insert long M9 bolts from the front of the starter motor through the metal gasket to help align it. I didn’t need to do this however. 2. Prepare Transmission. Pre-position the hidden bolts in a way they won’t fall out. I stuck duct tape over bolt holes #1, 2, and 3, cut small slits in the tape, and inserted the bolts partially into the holes (don’t let them extend from the holes on the engine side). Now I didn’t have to worry about how to insert bolts into holes I couldn’t reach or see. Shift the transmission into a gear (to allow the input and output shafts to spin together) and move under the transmission tunnel. 3. Insert Transmission. You are going to need one other person and a floor jack to rest the transmission on when you need a break. Remember, do not allow it to hang on the center input shaft as that could cause it to bend. a. With one person under the front of the transmission, and another at the back, lift up transmission and maneuver the transmission input shaft through the pressure plate and into the flywheel. 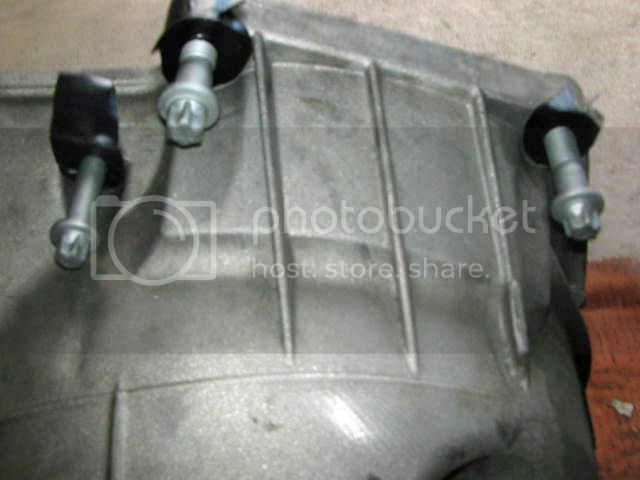 This will require some twisting and shaking as you push the transmission into the engine. 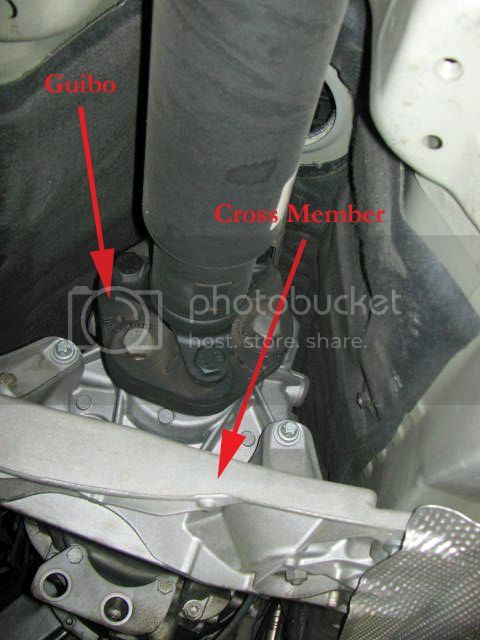 Turn the guibo on the output shaft as you push to align the input spline with the clutch disk. b. Support the transmission with a jack when it is within about two inches from the engine. Confirm that the splines are aligned. The splines are aligned when you can’t turn the output shaft any more. You can confirm this by using a 24mm socket at the front driveshaft pulley to turn over the engine; if the output shaft turns as you turn the engine, you have successfully got the input shaft into the pilot bearing (you will have to remove the electric fan to get to the driveshaft pulley). c.	Visually inspect the bolt holes to ensure that the metal gasket isn’t in the way and that they are aligned with the threads on the engine. You may need to use the inspection mirror. d.	You can use the bolts to move the transmission the rest of the way. Start with the easy bottom bolts and ensure that they are going through the gasket as you tighten them hand-tight. When the easy ones have been started, start the hard to reach ones. Use the same technique on bolts 1, 2, and 3 that you used to remove them. e.	Do starter bolts #10 and #1 last. You can observe these bolts to ensure they are going into the starter by placing your head by the driver side A-Arm and looking up towards the transmission. Use a long pry bar to nudge the starter motor towards the bolts. f.	When the gap between the engine and transmission is about ½ ”, check to see that the starter motor is aligned with the bell housing dowel. Loosen bolts and shift the starter with the pry bar if needed. 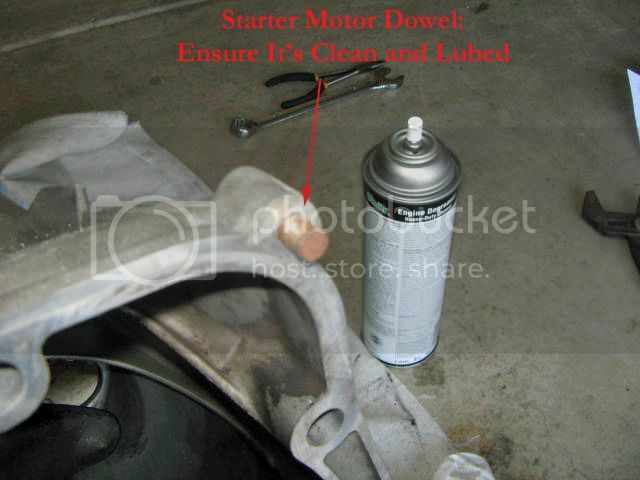 Ensure the dowel enters the starter motor as you tighten the bolts! Torque all bolts to spec. 4. Mount Clutch Slave Cylinder. Reinstall slave cylinder. 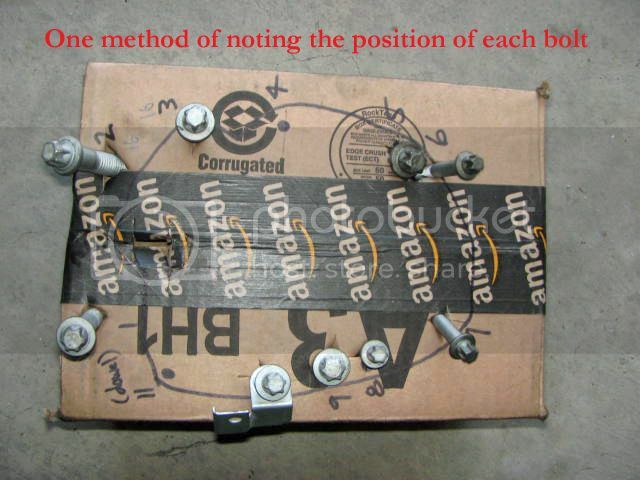 You may have to push in actuator rod in order to start the nuts onto the studs. Torque to spec. 5. Install Shifter. If you aren’t replacing the shifter, consider removing it from the carrier, cleaning the joint, and putting a fresh coat of lithium grease or Superlube. Reinstall carrier onto transmission and chassis. Attach shift rod. a. Remove jack from front of engine. Lift and support transmission. b. 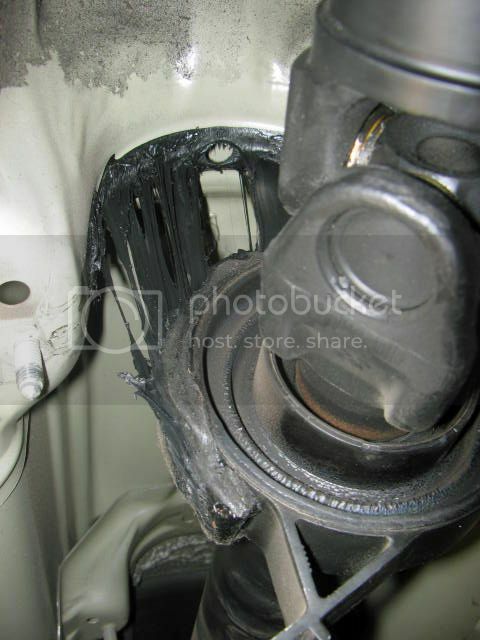 Ensure driveshaft center bearing cap and chassis is clean of Butylene residue. Put thin coat of mineral oil on chassis where center bearing Butylene tape will attach (this is to prevent the Butylene tape from sticking to the chassis during driveshaft installation…the tape will distort if you do not). Remove the backing from one side of the tape and stick it to the bottom of the center bearing cap centered. Remove the backing from the other side. 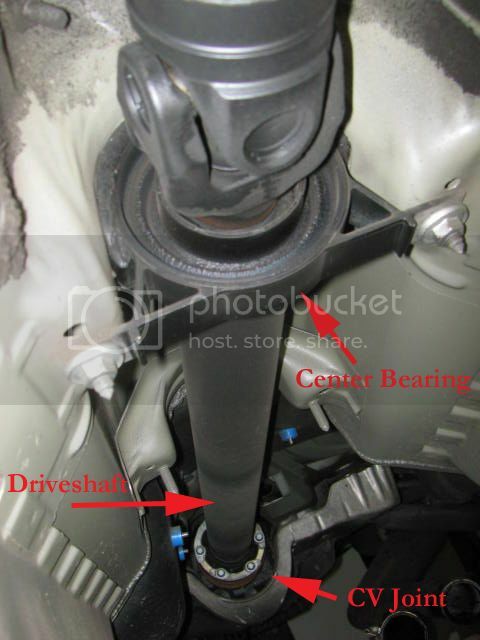 Raise the driveshaft, insert the center bearing cap, and screw in the bolts finger tight. c.	Align the driveshaft end onto the Guibo and insert the bolts. Screw in the bolts and torque to spec. You will have to hold one end with a wrench. It is helpful to have two people. 7. Install Transmission Cross Member. a. Install rubber transmission mounts onto cross member. Note that there are recesses in the mounts that fit onto protrusions in the cross member. Screw in the nuts and torque to spec. b. Install cross member. The rubber mounts slide into the channels of transmission mounting tabs. Bolt the cross member bolts finger tight into chassis. Tighten rubber mount nuts finger tight. Ensure that cross member aligns with the original markings. 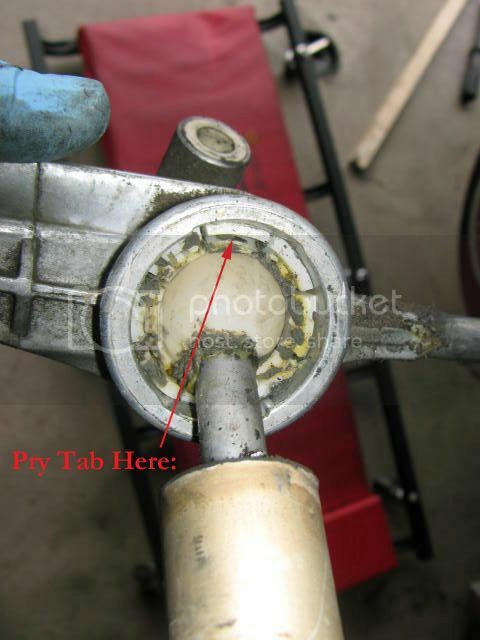 Use a pry bar to align transmission if necessary. Torque cross member bolts to spec. Torque rubber mount nuts to spec. c.	Tighten center bearing cap to spec. 9. 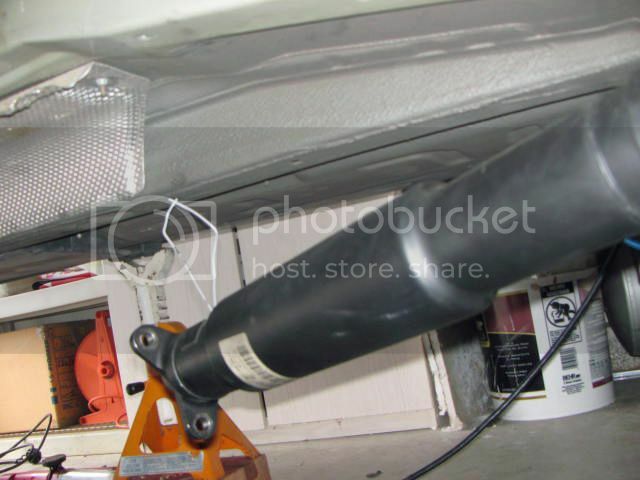 Install Exhaust Pipe. Use copper anti-seize paste on the exhaust manifold studs and any mating surface between exhaust pipe connections. Install new manifold gaskets and screw on exhaust pipe nuts and torque to spec. 10. Install Suspension Reinforcement Plate. Hold up plate and install new bolts. Torque to specification, then turn an additional ninety degrees. 12. Install Shift Boots and Knob. Now, take her down off of the jack stands, take it for a test drive, and bask in the knowledge that you saved yourself almost a Grand in labor costs and had a lot of fun in the process! Last edited by lkstaack; 03-12-2013 at 12:51 PM. This clutch replacement took me about 16 hours. However, I work slow, went down a few rabbit holes I didn’t need to (I’m kind of dense sometimes), and did other procedures while I had the car up. I think that I could easily replace the clutch now in about eight hours. •	Work Safely. Murphy reigns supreme around cars. 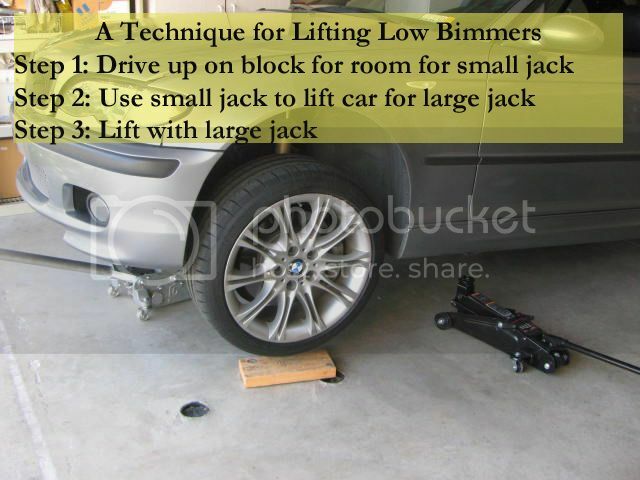 Start from a level surface when you lift your car. Don’t get under your car until it is supported properly. Shake your car hard after they are up on strong stands. It is absolutely critical to wear eye protection when working on cars, especially when you are under them; it is easy to lose an eye. Wear gloves; I wear rubber gloves with mechanics gloves over them (I take the thick gloves off for delicate or tight work). Wear hearing protection when around air tools and other loud sounds. Ensure you have plenty of light. •	Work Cleanly. Keeping your work area clean will help you spot parts that have fallen, spot new problems (oil drip? ), and help you move around the work area. I wear overalls so my clothes are clean when I go in the house or need to buy more parts (again). •	Be Organized. Separate and organize your parts so its easy to find them. 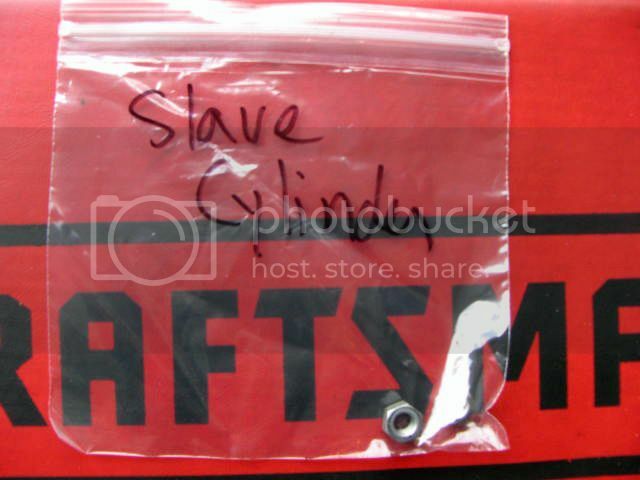 I keep small parts in a plastic bag and label them, and larger parts in a box. Keep your tools together to prevent loss or wasting time looking for them. I keep small tools that I am using regularly in a small box near the work area, otherwise they are in my tool box. •	Rethink the Problem. One of the most interesting part of mechanics is when something doesn’t work as you anticipated. For instance, when you can’t reach a nut. If what you are doing isn’t working, stop. Rethink the problem. Maybe you can see the problem better if you reposition yourself. Perhaps putting the light in a different spot will allow you to spot an obstacle or opportunity. Think of a different way of doing something. Identify what the real problem is, consider all the possible ways to solving that problem, then select one of them. Select another solution if that doesn’t work. Removing the Transmission. I wasted a lot of time removing the bell housing bolts because I didn’t use the proper technique or tools. The biggest time waster was trying to unbolt a T16 bolt with a T14 socket. None of the E46 clutch guides I read detailed what socket sizes to use. You see, the other large bolts were T14, and a T14 socket will fit over a tapered T16 bolt about ¼ of the way. You won’t know it isn’t fitting right if you can’t properly see the bolt. I was certain that the socket was the right size, but that it was slipping because I couldn’t get the right angle on it. I decided to try a larger socket on a lark, and it fit perfectly. Lesson learned. I tried to angle the transmission down enough so I could reach bolt #2. I even loosened the engine mounts, but ultimately was unable to reach it. I found you don’t need to touch it to place a socket on it, you can see the bolt by either using an inspection mirror, or putting your head near the transmission output shaft and looking up the transmission. 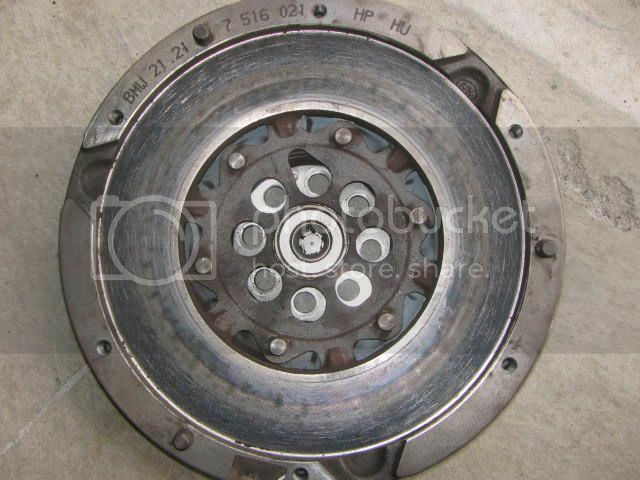 Most E46 clutch guides recommend using multiple long extensions with a universal joint. 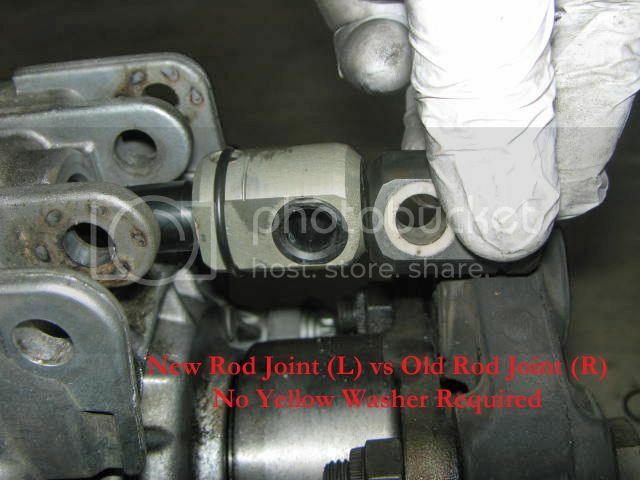 U-joints are difficult to manage when you can’t touch them and they are on a long extension. I found that a “wobbly” extension provides enough flex to reach all the bolts except #3. Adding it to a 24” extension was the best solution. Once I figured this stuff out, the bolts came off quickly. Installing the Transmission. This part is when you find out if the clutch alignment tool worked. The transmission input shaft spline won’t fit into the clutch disk if it isn’t aligned properly. I have tried to install a transmission with a clutch disk that was misaligned by an alignment tool that was almost good enough. It is not worth the grief. Get a tool for a 6-Speed. Installing the Guibo. I installed the Guibo twice. Once without thinking, and then another time with the arrows pointing to the flange arms like you are supposed to. I had to get new flex disk nuts from the dealer. Other Procedures: This is a great time to perform other procedures while the car is up on stands. Consider: Oil Change, Brake/Clutch fluid flush, transmission and differential oil changes, adding a short shift kit, or replacing existing shifter wearing parts. The Bentley Manual or the BMW ETK specifies that the hardware/supplies listed below should not be reused. The nuts are one-time use locking nuts and the bolts are designed to stretch a specific amount. Many people elect to reuse this hardware, but I’m not certain it is safe. I almost didn’t replace the Butylene tape, but I suspect its purpose is to reduce driveshaft vibration (Going off-topic here, but a buddy of mine who is an Aero Engineer with NASA suspects that the dreaded E36/E46 subframe cracking phenomena is a result of harmonic vibrations caused by the driveshaft. He says that rocket engineers are always seeking out sources of harmonic vibrations). 1. Remove the Shift Lever from the carrier. Pry up on one of the two white plastic shift lever bearing tabs and lift the assembly up and out. 2. 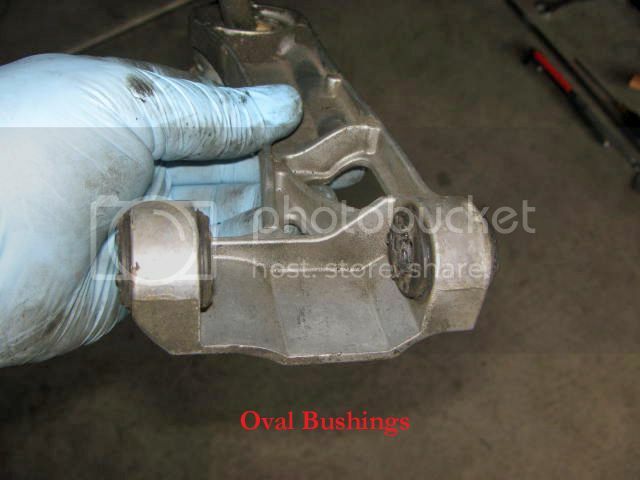 Remove the two oval bushings at the end of the carrier. Thank BMW Engineers for finally developing a carrier that doesn’t wear out bushings. 3. Clean the carrier and any other shifter parts you are reusing. Lubricate the white shift lever ball and shift lever bearing with either Superlube ™ or white lithium grease. 4. Pop the shift lever into the shift lever bearing. Pop the shift lever assembly into the carrier. 6. Pry up the circular clip end up and off. Push the pin down and out. Remove the joint and replace with the new one. Inspect the foam inside the old joint. If it is dry and shriveled, you have found one reason for shifter slop. Observe the picture below; note how the new joint has black plastic protruding from the selector rod joint. This seems to eliminate the need for the yellow plastic washers, because the washers won’t fit with the new parts. 7. 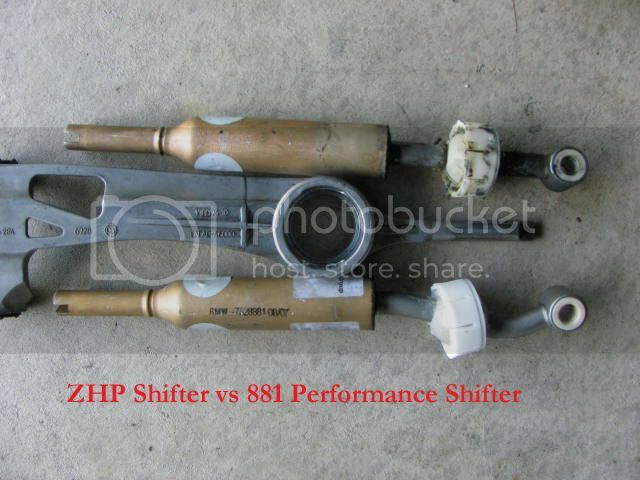 Here is a comparison of the new 881 performance shifter and standard ZHP performance shifter. The only difference I could note was a bend in the new shifter. I don’t note a difference in performance, throw length or effort between the two. See that the new shifter has protruding plastic from the selector rod joint like the new Rod Joint. I hate waiting on parts, so I often will pre-purchase parts that I suspect are worn, near the end of their service life, may break when I remove them, or I think I might lose during the process. I decided to purchase all new pressure plate bolts because I read of one account where they had to be cut. Mine were perfectly good; I didn’t need new ones. I got one each of every bell housing bolt due to concerns that I might break off one during removal. Nope, they were all good. I ordered a new Guibo and transmission mounts because the ones on my E36 M3 were shot at 75k miles. Nope, mine were both good. All the plastic parts on my E36 M3 shifter were shot at 75k miles, particularly the foam within the rod joint. All good in my ZHP (I suspect that the 6-speed unique fork-mount design on the shift carrier adds stability that reduces wear). I thought that the 881 performance shifter would shorten the already short ZHP shift throw. Nope, it just brings the shift knob slightly closer to the dash; the distance between the shift pivot point and shift rod joint are the same. New plastic shift washers? Nope, the new OE BMW rod joint and shifter parts use plastic (delron?) at the friction points that preclude the need for washers. The car didn’t perform well the first couple of days after the clutch job. First, I would feel a vibration through the seat and steering wheel from about 0-30 MPH. There was also a loud buzzing rattle coming from the transmission tower. The clutch chatter was strong and loud. I removed the exhaust and heat shield, and noticed that the transmission cross member wasn’t aligned properly; it was about 5mm off from where it originally was. I loosened everything up and used a pry bar to get it to about 1mm to where it was. I put everything back together and found that the rattle was gone, but the vibration was still there. I pulled everything out again, and replaced the UUC transmission mounts with my old OE ones. The cross member lined up perfectly and everything runs smooth now (except for the chattering). Perhaps the UUC mounts were good, and I improperly installed them. Draw your own conclusions. I met most of my original goals. I kept expenses to a minimum (although I should have purchased the Butylene tape from ebmwparts.com). The Sachs pressure plate from UUC increased the clamping force. I ended up replacing parts I didn’t need (the Guibo and shifter parts all seemed to still be good), and I ended up using the OE transmission mounts even though I purchased new UUC ones. I replaced all of the hardware that the manual directed (I ended up replacing some nuts more than once due to my mistakes). I feel strongly about replacing parts with OEM as much as possible, though I still wouldn’t use an OE S.A.C. clutch. It turned out that I didn’t need the backup hardware (bell housing bolts, shifter clips, etc), but I had them ready if the original failed. Why did my clutch slip at only 90k miles? Although there were some burn marks on the flywheel and pressure plate, they weren’t bad. Likewise, the clutch disk showed wear, but it still seemed serviceable (although the wear didn’t seem uniform). I don’t know why it slipped, but I suspect that the self adjusting clutch design had something to do with it. The clamping force from the Sachs pressure plate seems much, much stronger (at the expense of clutch pedal effort). Here are pictures of my original flywheel, pressure plate, and clutch disk. 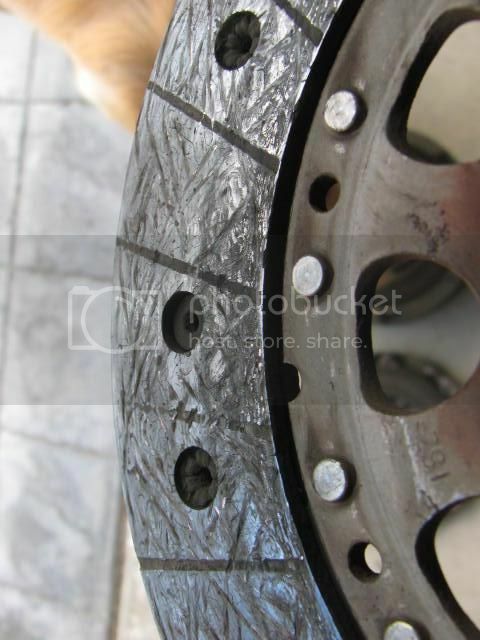 I hope that this DIY provides the information that you need to complete your own clutch job. Please inform me if you identify any errors or omissions and I will update the posts. Last edited by lkstaack; 03-13-2013 at 08:13 AM. Looks like the start of an impressive DIY thread! Very cool of you to take the time to do this. I don't have a clutch, but I appreciate the detailed DIY contribution to the site. Excellent write up so far. Thanks for taking the time to do so. I expect to do this job in the next 6 months. I'm sure this will save me a TON of time and research. Outstanding thread. Thanks so much for taking the time to put this together.